abas ERP is a 2018 Capterra Top 20 ERP solution for mid-sized manufacturers & distributors. With 30+ years of experience in ERP, we are experts in implementations in industries like custom manufacturing, industrial machinery, fabrication assembly, electronics, and auto & supply. We offer cloud and on-premise hosting solutions, with reporting, workflow and mobile ERP for your entire organization, including management, finance, purchasing, sales, service, accounting, production and warehousing. abas ERP Reviews Recently Reviewed! Abas made our business run better and enthusiastically gave me the tools to make abas even better for our unique business. Comments: I have enthusiastically recommended abas to several other businesses. The abas-USA team is great to work with. Even at the highest level (owners and executives) they take a personal interest in their clients and have a deep understanding of their product. It would be expected that someone in my position would interact with several consultants and technicians at abas-USA but over the course of the last five years I have also come to personally know the over/President of abas-USA as well as the VP of Operatoins, the VP of Information Systems, and pretty much the entire US-based management team. I have also had the opportunity to meet several of the German executives, company officers, and programmers to discuss the system. You can't fake the enthusiasm these guys have for their customers and for their product. Pros: It's a complete solution - you won't be asked to pick and choose between dozens (or hundreds) of modules that can be included or not during implementation. This program was also not cobbled together from disparate programs and modules purchased by some corporate entity and bundled for sale. Abas technical support is excellent (more on that later). Abas user support and training is also excellent - they run what they call the "abas academy" out of their Virginia offices. They have frequent multi-day training courses focused on different aspects of the software. The best are the technical training courses where they teach 'higher-level' users (like the system admins from their clients) how to program customizations for themselves. Some of our most useful processes were programmed by me in-house. Abas is always getting better and changing with advances in technology. The program is remarkably stable. It runs (preferably) on a linux server and uses a custom designed database (that is a big $ savings over an erp running on a windows server using an SQL database). In four years, the only time our ERP system has been down has been during power failures or when I did something to break it. When I did disrupt the system, during non-business hours, the support team had us up and running again withing an hour. In general, support tickets are handled very promptly. Urgent or critical tickets are addressed immediately. There is a group on LinkedIn where users communicate and help each other out. Many of the members are "IT Manager" types who use/administer/customize abas where they work. Cons: On the technical side, getting into programming the proprietary database means a bit of a learning curve for anyone who is used to using SQL. Mobile applications aren't fully implemented but more are constantly being developed. The mobile app server addition is a significant investment. The system had no built-in capacity to close idle sessions (to free up licenses for the pool) so I had to program a work-around. I have had a couple instances where a fairly green support tech got assigned to a ticket and wasn't much help. Pros: ABAS has the ability to connect to design software such as Solid Works. This connection allows our engineers the ability to create parts, work orders and bills of materials with a click of a button. This is a huge improvement over the manual systems we use to use. ABAS is also very customizable. This allows us to fit the ERP system around the way we like to operate instead of settling for methods that may not be exactly what we wanted. Cons: As with any ERP system, there is a ton of content, screens, reports and applications. For a new user, this can be overwhelming and typically takes some time to understand the navigation and how to utilize the system. ABAS has done a good job making navigation similar between all screens but this also can cause confusion as to what screen the user is working in. With practice and training this becomes less of an issue but is a real challenge for new users. The addition of a central reporting system with pre-made reports that can be modified as needed, would also be a welcomed addition. Currently reports are embedded within info-systems and not always obvious to the user. Comments: Pankl Racing Systems, based in Austria, specializes in developing and manufacturing engine and drive-train components for racing cars, high performance vehicles and the aerospace industry. Pankl is a global organization with worldwide subsidiaries in Austria, UK, USA, Slovakia and Japan. In Austria we've been using abas ERP since 1995, in the USA since 2002, in the UK since 2004 and in Slovakia since 2008. At the moment we are running abas ERP version 2009r4n11 at all the Pankl subsidiaries. We decided to use abas ERP because it provides all the necessary functions for a mid-market manufacturer like Pankl and from our point of view it has a really good cost/performance ratio. Another benefit is the flexibility of abas ERP. If your company needs customizations, like additional fields in screens to enter data or personalized reports, abas can make that happen. 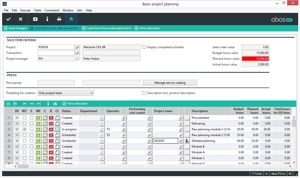 I was not personally involved in the abas ERP implementation process in Austria and the UK, but I never heard anything negative about these projects. The implementation process in the UK and in Slovakia took 3 to 6 months at each subsidiary. It took us a little bit longer in Slovakia compared to the UK, because we are running abas ERP in Slovakia in 4 different languages: Slovak, Czech, English and German. Both software vendors, in the UK and in Slovakia, were really helpful during the whole roll out process. We received all the help we needed during the implementation process and I really appreciate the fast response time of abas USA when there are problems or just user requests. In a demo system, which is actually a copy of the live database, each department receives special training in abas ERP. This approach has 2 major benefits: 1. The user has the chance to increase his knowledge of abas using familiar examples from the live system 2. 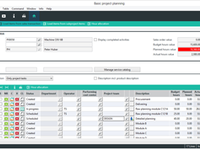 The user is already in contact with the abas ERP system, but in a "save" demo environment, where he cannot damage anything in the live database. Based on our experience such lessons are more efficient for a new user than just classroom lectures. Our users usually learn to use abas ERP really quickly after these training sessions. As with each software solution, abas ERP has "special" features and functions, but if you are aware of them you gain a big advantage in handling the abas ERP software. 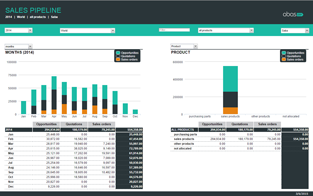 The biggest benefit is to have all the relevant data from purchasing and sales, production, materials management, production planning and control (PPC) and financial accounting combined in one system. Pros: This ERP software is very flexible and customization to fit our needs. It also contains many "cutting edge" features like integration with Solid Works engineering design software, E-Business, Document Management and Business Apps that many of the others did not have or were "bolt" on third party add-ons. Working with ABAS through the install and continued support I have to say the feeling that we are part of the "family" is what I like best about this vendor. They take the time to listen to what you are trying to accomplish and work with you to solve your issues all while maintaining a positive attitude. Cons: The source coding is in German. While this doesn't affect the average user since all screens are translated to the native language it makes it a little more difficult for advanced users who wish to do their own programming or screen adjustments. Recommendations to other buyers: With all ERP software, it's garbage in and garbage out. If you load erroneous or incomplete data into the software you cannot expect good clean reports. Making sure that data is complete and accurate before migration is key. Secondly make sure what you see in a sales presentation is included in the quote you receive. Some companies will show you every bell and whistle only to find out later that it's only included at an additional fee. ABAS had everything that was included laid out for us so we knew exactly what we were getting. The only additional fees were for customizations that we specifically asked for. Comments: It is great to have an ERP solution that has so much capability to provide for unique business solutions. The problem with the ease of use, is tracking these changes and creating more maintenance and upgrade work in the future. Make sure to check functionality in the core product before you add custom solutions, often you can meet your requirements with just a little bit of training and small changes to your process. Best flexibility and functionality for your money! Pros: Ease of extending new functionality to the database. Overall: Trust Automation has been using abas ERP since 2011 and I have been working on building custom solutions here for 3 years. I am impressed by the ability of abas ERP to easily allow me to create new functionality and improve business processes to help our users. The online help manuals were original translated from German, but they are continuously updating them to be more current and readable. Also, new training manuals have come out which are very easy to read and have examples to work through. Both abas USA and their parent company abas AG are doing a great job at innovating and bringing new functionality and expansions to the product. The RESTful web services that are now available allows so much flexibility to display the data and have the ability to create interactive web-apps for dashboards. Comments: My organization is an engineer to order business that services many different industries and applications. We have a base product that can have hundreds of options that are added to it making BOM creation and credibility difficult at times. Prior to moving to Abas ERP, my organization used M2M, which was not easy to use and was not easily customized to accommodate our needs. To make customizations in M2M, we had to have a programmer right a number of external programs that would write to M2M allowing us to get what we needed from the system. Although this helped us, it also kept us from receiving support from M2M and allowing us to upgrade to newer versions. The switch to Abas ERP was a very good transition much easier than I anticipated. I believe a lot of this has to do with the amount of time we took to test and ensure all our information was entered into the system properly. We spent nearly a year preparing the system to go live and with the help of the extremely knowledgeable and helpful consultants. I can say that we have a great deal of confidence in the information in our system, which is something we never had with our previous system. In addition, we spent 4 months of training the users twice a week prior to going live and when we went live, our users knew what they were going to see and were very prepared for the transition. We have been on the system for 7 weeks now and I can honestly say that we have had VERY few problems and when problems have come up, Abas has been quick to address them and help us through them. The only area that I think the system lacks is in the area of subcontracted parts. The system does limit you to what you can do with these parts, making switching parts to and from subcontracting an extremely daunting task. All-in-all, I could not have asked for a better experience with an ERP system and organization and this is my third ERP system implementation in 12 years. Pros: Unlike some larger ERP companies that when need assistance you get a different person every time you call - with Abas you have a select group of people assigned to your company that you can build relationships with. They become very familiar with your company and how it works. This in turn is helpful as you grow and want to make changes within the system since they are already knowledgeable about your business. Cons: It's both good and bad...the system can do so many different things (which is great!) but it can be overwhelming at first. When you see demos of things you like and want to have right away when you start up you find that you need to take a step back and get the basics running first. Comments: We were misled during the sales process in that we were told the system could function in ways that it cannot. The implementation process was a mess as it took 16 months then on the day of launch we were provided a product that did not work. Initially Abas would not listen to us when we told them that it was not functioning. It took months for them to send a representative out to take a look and the conclusion was that we had to start over. Abas created a new system for us and we had to re-create six months of data re-entering all sales and A/R, but it was impossible to do all data, so the purchasing side was entered as opening numbers. We lost some detail from the sales side as well. We have historical data that can never be retrieved. Pros: Integrated with the financials. Very easy to move data to excel. Many screens within Abas function like excel which is handy. Can customize many reports. Cons: Requires too many customizations to meet needs, which gets very expensive. Some basic financial and CRM functions do not exist. An example would be it will not process a reimbursement. When you need customer service you put in a ticket and often get a programmer who has not worked on your system or does not recall the details of your system/company and so you pay for them to research your issue. There are bugs with the system functioning on mac even though they claim compatibility. Not all of our users are on mac. I have had some functions mysteriously malfunction and we have to pay Abas to get it fixed. Comments: We have our first plant running live now with Abas and will bring our 2nd plant online end of this year. It has been a challenging but productive year for us. As with any implementation of a new ERP system there will be hurdles along the way. Due to the nature of our business we have needed to make a bunch of customizations within Abas. The team we are working with has been very supportive and done a great job of helping us determine the best way to make these changes. Our company is also using 2 functions of Abas that not all customers are currently using. EDI and Simcron are the systems we have utilized to bring in all our customer orders electronically and generate a production schedule. The Abas AG team in Germany has been working diligently with us to learn these 2 systems and help with any problems we have had. We have already found so many ways to save time for our employees and simplify their day to day ERP activites with Abas; so we are looking forward to having the entire company changed over in the next couple of months. ABAS is an ERP system made complete by its functioning software and knowledgeable personnel. Pros: ABAS is completely customizable and you can get out of it whatever you put into it. Implementation is never an easy task but ABAS has it down to a science. We went live in January 2016 and have not looked back since. The team of support was great. ABAS is always improving and moving forward which makes it an exciting company to be partnered with. Cons: The support system is on a portal that I find confusing. I would rather pick up the phone and have a conversation with someone and that is what I will often do. Pros: The product is fully customizable. 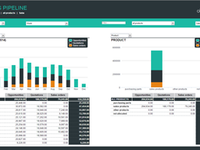 A business can actually successfully launch this ERP within the budget set. Abas-USA does a fantastic job of keeping the customer in the know for how well you are doing with your goals, and letting you know how much you will have to do in house in order to keep your costs down. If you are willing to spend, they are great at doing the work, training the users, keeping everyone in the know. Cons: Some core functionality you would expect from a software is not there. Specific accounting rules, tolerances, etc. The training manuals are not well spelled out, or are few and far between. Recommendations to other buyers: If you have all of your expectations, structure built, designated team for launching & data entry, sensible timeline, roadmap, then I would say the business is ready to start, reviewing. 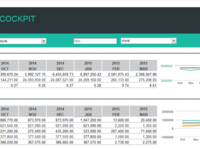 Pros: The ability to manipulate data to create customize reports I find is extremely valuable. As a manufacturing company, I find It's ability to store all information in one erp system saves every department time from maintaining information in different databases and gives us quick access to any information we're looking for. Cons: The learning curve is longer compared to the standard , more conventional software options and requires the user to be more skilled. Cons: - We have large & complicated bills of materials that were difficult to manage. We did a bit of work to get them flowing through abas effectively. The best Linux based ERP software in Europe! Pros: I have personally worked with the vendor in Karlsruhe for the Bulgarian localization and I can tell they are very flexible and efficient team and they do the job. I like abas ERP as this is the only Linux based ERP that has the complete functionality developed as a regular ERP with particular focus in production, which is in itself rare for any ERP. Cons: Although it is commercial for a Linux based product the company that chooses to use it has to developed a small team of Linux professionals (which are more expensive and rare to find in Bulgaria than Windows specialists) internally. Recommendations to other buyers: Make sure you develop a complete business case for this ERP with its alternatives as in the long run (3-5 years) it may cost you as much as another none Linux ERP. Comments: Lisega, based in Zeven, Germany, is the worldwide market leader in the pipe support industry, primary servicing the power and petrochemical industries. We are a global organization with manufacturing facilities in Germany, France, the United Kingdom, the United States, and China. In the early 1990s, Lisega realized that with our planned growth, we would not be able to manage the business with existing systems. Abas ERP was selected as our new standard business software, and implemented in Germany and the US in 1993, with all other sites following over the next few years. Since implementation, global sales have increased over 500%, and Abas ERP has kept pace with and supported our growth. Almost all of our 1,100 employees directly use or consume data from the Abas system on a daily basis, from the production floor to the CFO. The greatest benefit to Abas, from our point of view, is the flexibility. Over the past two decades, we have implemented hundreds of additional features to support our business processes, have integrated Abas with our other applications (project management, APS, document archiving, PLM, CAD, and others), and have done all of it using our in house IT staff. When support is required (either development or operational) we have found the Abas staff to be knowledgeable, responsive, and supportive of our efforts. Overall, it's fair to say that Abas ERP has been a significant contributor to the success of our business, and I strongly recommend it to the SMB manufacturing community. Pros: It is very friendly, has a lot of different options and ways of actions. Few people may have an access simultaneously. Cons: It is still complicated to work with products received to repair. Maybe this is only our specific issue. Cons: That vendor information as far address, 1099, vendor payments and invoices were not in the same module. The ability to see what invoices were paid and how at face value. the Current payment module was difficult to read and not was user friendly. My experience with previous softwares we had the ability to take a screen shot and send to a vendor their activity and they would be able to read. I also dislike that AR and AP could not both post to the same supplementary General ledger account for sales tax payable, this was extremely frustrating. Recommendations to other buyers: Need working instructions that are updated with the version individuals have. After going to the training workshops in Virginia and coming back home with training manuals that did not match the system was frustrating. Pros: abas ERP captures so much detailed information, allowing us to create customized reporting. The customer support personnel have been amazing to work with. Cons: Our initial set up team was disbanded which resulted in some gaps in the implementation. The team members we have worked with since have been wonderful. Pros: There is nothing good. We have had the worst experience from day 1. Waited too long to move from them. Cons: From sales to implementation we have had nothing but failures. First day installation of sandbox failed. It took them a week to get this installed. We were then promised a system with applications to move product seamlessly, one swipe. This software will not allow product move until employees log out for the day and obtain a managers approval. This limits an organization to one product move per day. Unacceptable in a fast paced environment. We have encountered countless errors with a system that is vanilla ABAS as they say. No MODS. When we decided they were not a fit they immediately recited page 4 line 17. Miscellaneous on the contract holds them harmless without accountability. They recite it like a daily prayer. i am thinking this isn't the first time this has been an issue. Caution to anyone looking at ABAS for their ERP solution. Pros: This Abas ERp ia very helpful for me as a begginer in ERP. Easy to use and easy to learn. Tume saver. Cons: Don't see any cons about Abas ERP so far for two years of using it. Can say nothing bit good experince. Pros: This software has a file icon that has become significant in the process of my researching. It allows for me to see the flow of any purchase order. I am able to search for the purchase order in question and click on the file icon which shows me up to the invoice the purchase order was processed to. This has saved me time in researching if a receiver has been misplaced into a wrong invoice. Cons: The biggest inconvenience I have found in this software is the inability to easily make corrections. Once there is an error posted, it has to go through a process to make it right. Recommendations to other buyers: I highly recommend getting comfortable with the system. If you set aside time to familiarize yourself with the screens that open up with each click it will help you in understanding how simple it actually is. Pros: I like how customizable it is. You can see as much or as little as you like on any window, and you can add more filters to reports if you are not satisfied with the standard. If you find you are running the same query all the time, you can make a quick report, which takes about 5 min. You typically do not have to go outside the DB to make a report. The vendor is good to work with. They pair you with consultants that fit your organization; they are all very personable and willing to help you out at any hour. Cons: It takes too long to answer the tickets. The accounting side of it is a little off of what we consider normal procedures. Recommendations to other buyers: If evaluating this particular one, understand that the demo product is fully customized. It is nothing like the standard out of the box when you open it. Pros: The ability of creating your own interfaces, assigning of group of people to your company is really best and of great ability. Cons: It is really time consuming in creating your interface for your company most especially to first time users. I got stressed up for the first time of use even though it's a software with marvelous features. Pros: This is the great and powerful system with different ways and options. You can create your own interface. Cons: Any updates need to be done if changes were made. Unfortunately it doesn't happen automatically in invoices. Pros: It was easy to learn & link to other databases for information. Cons: It is too easy to have too many windows open, the windows all tile individually, so you can get lost if you move around a lot. I have no complaints about the vendor, they are very involved personally with us. Recommendations to other buyers: From the prior product to this one, I would guess that it was the attention to detail that was given when reviewing what we needed. abas-USA was instrumental in touching all the main involved parties so that all were aware that all needs could be met. Pros: Easy to use and easy to learn and good for new beginner in ERP. Cons: Support is not good its take too long to answer the tickets. Cons: The backend of this program is all in German, so start practicing now. Everytime you add or remove a feature, everything else goes crazy. Sometimes adding features can be extremely difficult and you will need to be well verse in coding. Recommendations to other buyers: Dont try it on a trial basis, you need to see someone else who is currently using it. Pros: This is a nice software for the supply chain management as it options to track every material and also helps in billing and inventory. Cons: More frequent updates required as industry changes almost every day. Good customer support is required. Pros: ERP MARK 7 helps with order processing, inventories, supplier details, finance commission, processing, manufacturing, payroll, loyalty programs, HR, RFP, Employee performance, expenses and profits and other management operations of the company. Easy to use great integration with other systems. Cons: ERP Mark 7 was a great investment for our company. It was implemented quickly with minimal training time. The support team provided to us was very helpful and readily available. The Mark 7 dashboard provides a user friendly layout that is easy to use from the start. Overall: We are actively using ABAS and are in the middle of adding ABAS to another one of our facilities. Things are going exceptionally well! Pros: How many times can I have to find an app that works better than this one. Never mind the others, this one will fill all your needs. Cons: I don't like how the colors of he app hurt my eyes. If I use it on my iPad, my eyeballs would hurt and give me a headache. Pros: I like the ability to drill down and the ability to cosmetically change the user module to reflect the user's preference. Cons: It's mainly for super users and not regular data entry clerks. I feel the system is complicated and the program does not come with many standard features. Instead of standard items that you would find in an accounting module in another ERP software, they make them upgrades. Recommendations to other buyers: Look to simplify daily tasks, such as creating an invoice or a payment. It should be one-stop shopping instead of having to navigate through several modules to complete one task. Comments: Great application, great value for money. Pros: I believe the quality of them ERP system considering it's competitors' prices are great and can leave SMEs with a fullfiled inventory management system. Cons: Maybe there are a few limitations by the application to growing inventory or industries dealing with fast moving export warehouses. Comments: The advantages of this solution - more efficient operations, better communication and transparency - could already be noticed during the implementation phase . Pros: It is user-friendly product. My very first experience in ERP. So all I could say that ABAS allready gave me the good impression. Cons: Sometimes the bug of this product resulting a crash that can afect to my work. Recommendations to other buyers: I recommend that ABAS should does the minor bug fixing every day. Plan, organize, actuate and control. Pros: You can see all selections, which makes it easy to navigate through. Cons: It doesn't allow you to void, delete, or make corrections after you post. Recommendations to other buyers: Make sure everything is correct before posting. If not, save so you can come back to it later. Pros: There isn't much to like. Cons: I often found that the vendor did not have the answers to my questions. I always had to do something special to make it work. Recommendations to other buyers: Do as much research and ask lots of questions before signing up!